sparkle craft halloween special: sparkle "halloween trick-or-treatables"
NOTE: For the 2018 free Halloween printables and stories, check out the updated version HERE. 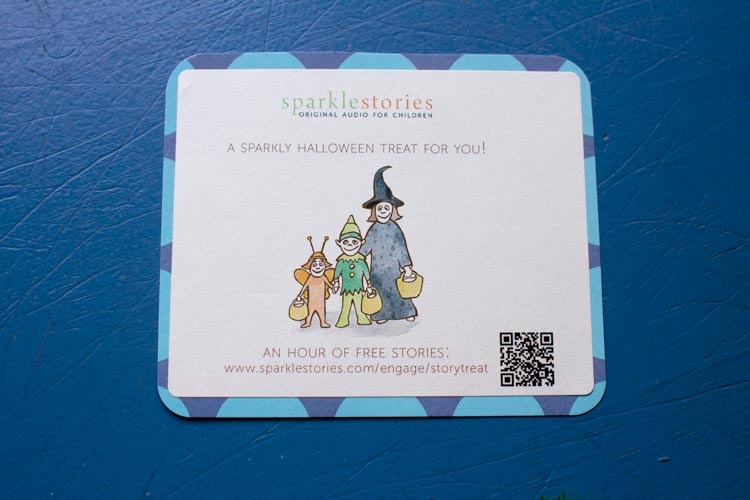 This year we've created our own Sparkle Story Treat for Halloween! It makes for an easy Halloween surprise for friends or a treat to hand out on Halloween night. 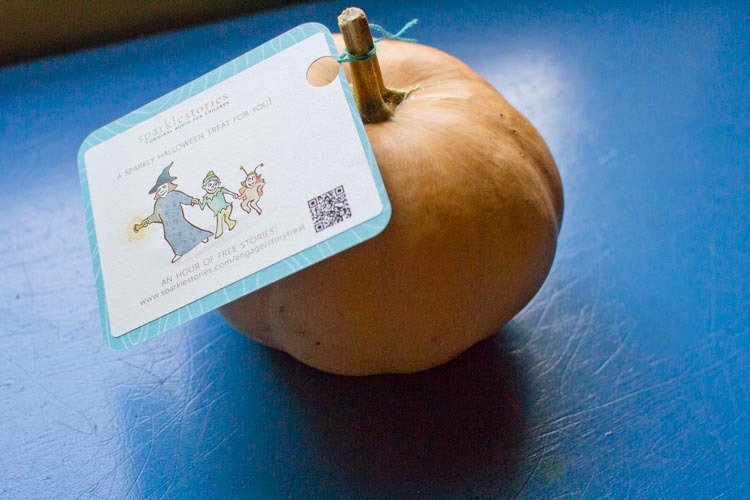 The printables feature a scannable QR code that unlocks a free hour of stories. Just click the links below to download! Print the B&W Version HERE. You can simply print them up on paper and hand them out, or you can print them on labels! 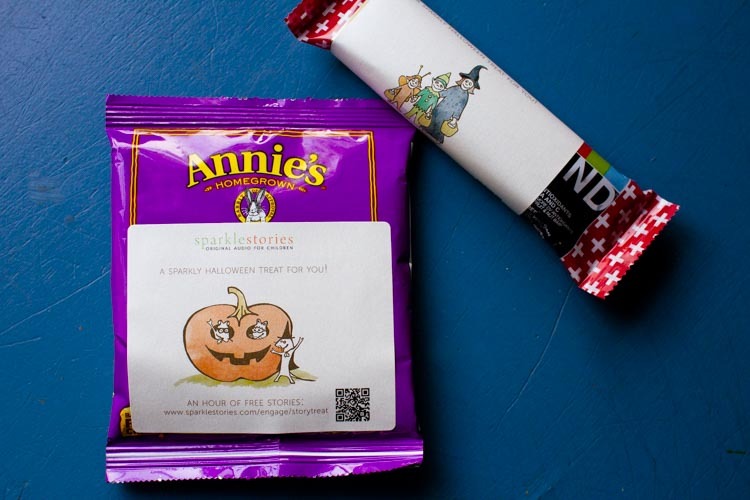 Our Halloween treats are made to fit Avery 3 x 3.75 inch, print-to-the-edge, rectangular labels (#22823). Pick up a pack at your local copy store, print them out as stickers, and try out a few of these fun ideas. Stick Sparkle "Halloween Trick-or-Treatables" on a pretty piece of patterned cardstock and mix them in with candy in your trick-or-treat bowl. This is a great non-food option to have on hand if you're concerned about allergies or don't like to have too much extra candy around the house. Tuck Sparkle "Halloween Trick-or-Treatables" into a goodie bag. Whether you're making goodie bags full of candy or you're handing out non-food treats — like stickers and mini-dinosaurs — a Sparkle Halloween treat tucks into a small goodie bag just perfectly. Attach Sparkle "Halloween Trick-or-Treatables" directly to other treats. No goodie bags? No problem! Take your printed stickers and attach them directly to larger treats like cheddar bunnies or granola bars. 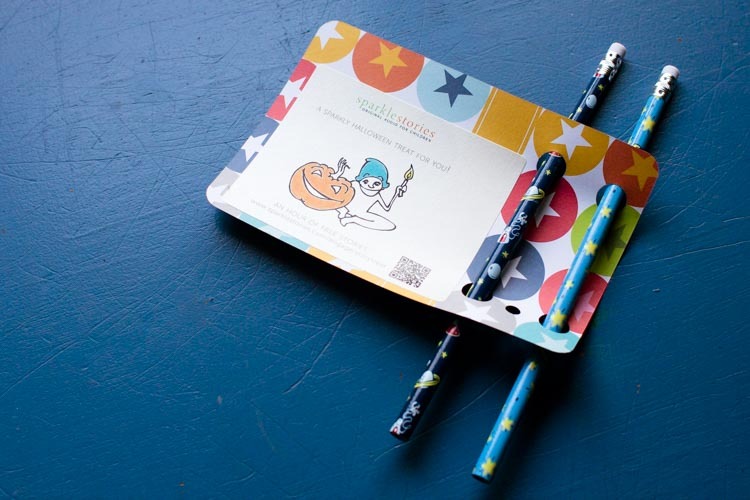 Add fun pencils or pens to a Sparkle "Halloween Trick-or-Treatable." Here, I attached a Sparkle "Halloween Trick-or-Treatable" to a piece of cardstock — it's about four inches by six inches — then punched holes in the other side to poke some fun pencils through. 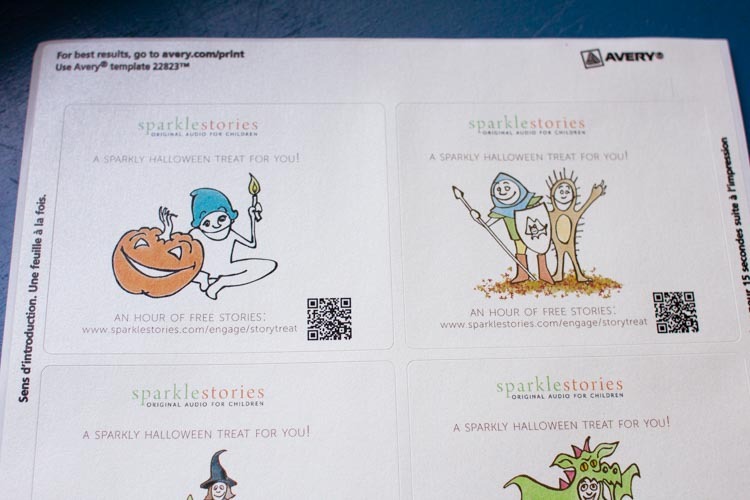 Pair up a Sparkle "Halloween Trick-or-Treatable" with stickers or temporary tattoos. 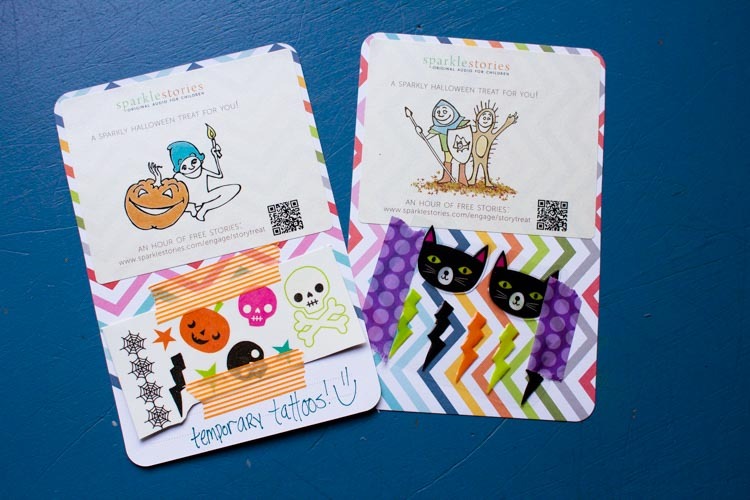 Again, attach the Sparkle "Halloween Trick-or-Treatable" sticker to a piece of cardstock, then use washi tape to add stickers or temporary tattoos. Attach Sparkle "Halloween Trick-or-Treatables" to a glider plane. While I usually dislike plastic “kid junk” that quickly ends up in the trash, glider planes are a definite exception. My kids love putting them together and will play with one for days. 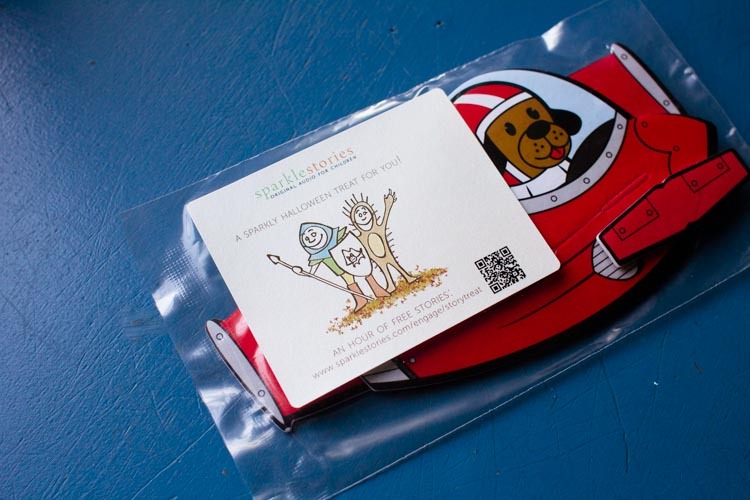 Stick a Sparkle "Halloween Trick-or-Treatable" to the outer packaging so kiddos can listen while they fly. 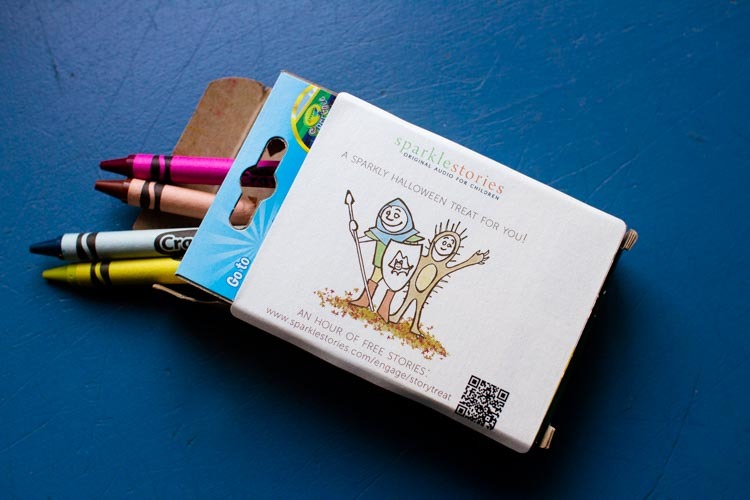 Stick Sparkle "Halloween Trick-or-Treatables" to a box of crayons. Sparkle "Halloween Trick-or-Treatables" fit almost perfectly on the back of a standard sized box of crayons. Everybody loves fresh crayons. 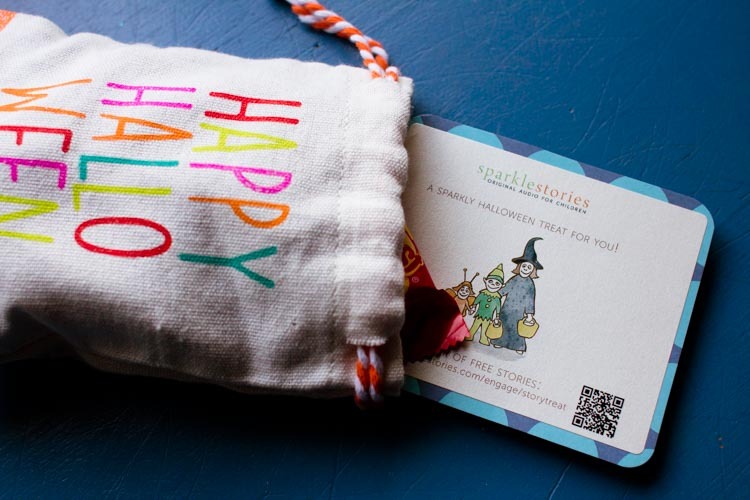 Tuck a Sparkle "Halloween Trick-or-Treatable" onto the back of a handmade mini-notebook. These little notebooks are a snap to make. Just fold a piece of cardstock in half, cut a few pieces of blank paper to fit inside, and use your sewing machine to quickly stitch a spine. Stick a Sparkle Halloween treat to the back as an extra surprise. 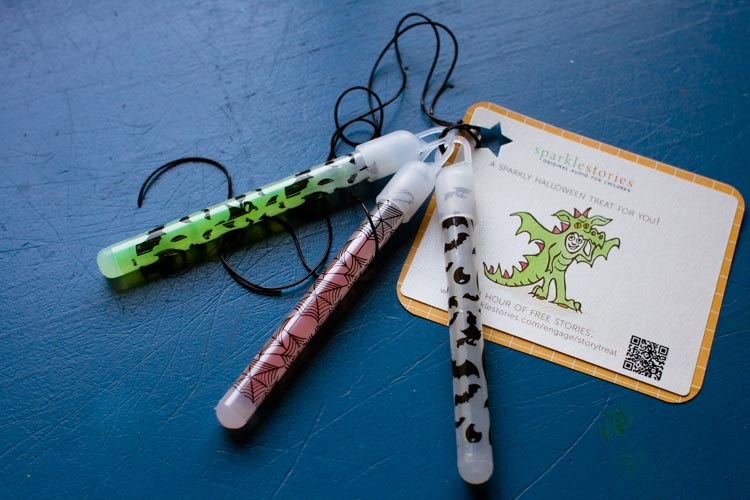 Tie a few glow sticks to a Sparkle "Halloween Trick-or-Treatable." With daylight savings time about to start, there will be ample opportunity for glow sticks. We love them as nightlights and for special “rock-and-glow” baths. Attach a Sparkle Halloween treat for a story to go with the lights-out fun. 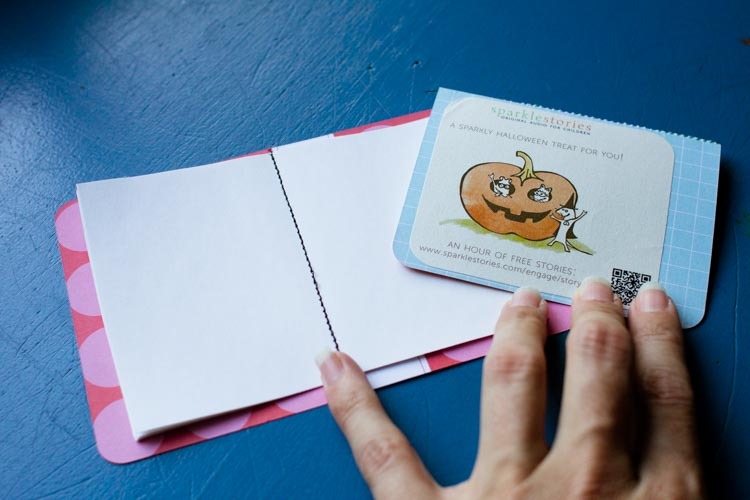 Put a Sparkle "Halloween Trick-or-Treatable" on the outside of an envelope with a small craft project inside. A friend of mine and her daughter have begun a practice of listening to a Sparkle Story each Sunday morning while she knits and her daughter makes art. 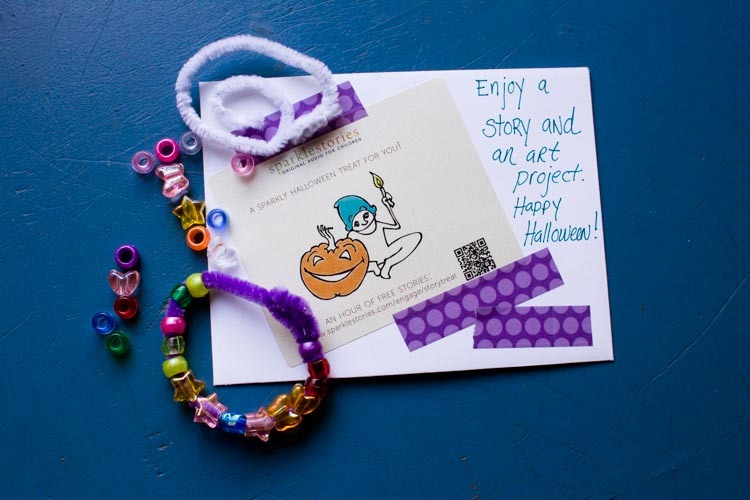 Put a Sparkle "Halloween Trick-or-Treatable" on an envelope with materials for simple craft project — like a pipe-cleaner-and-beads bracelet — to follow my friend's model and enjoy this sweet ritual. Add a Sparkle "Halloween Trick-or-Treatable" to a mini-pumpkin as a decoration that will last through Thanksgiving. The wonderful thing about pumpkins is that they are still seasonal for Thanksgiving. Tie a Sparkle Halloween treat to the stem of a mini-pumpkin for a little gift that will span both holiday seasons. Would you like to enjoy Free Halloween Stories this October? By signing up, you’ll automatically get a week’s worth of daily emails with a new story and related craft or recipe each day. Plus you’ll have access to our library of over 1,000 original audio stories for kids, for 15 days completely free!